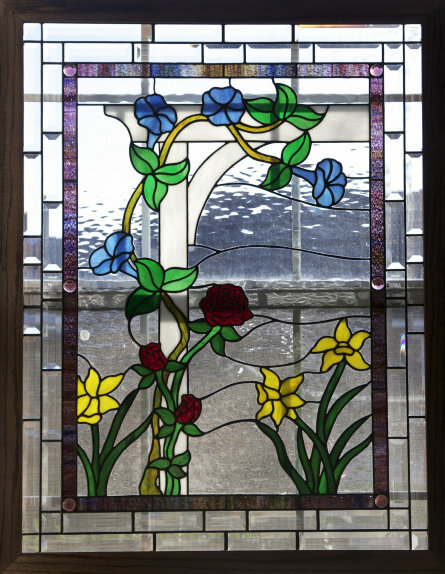 Sharon called me about building a stained glass window for her home in Raceland, Louisiana. 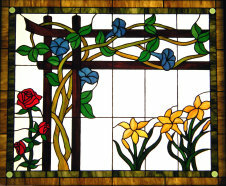 She has a kitchen window with full sun most of the day and wanted a window that be would be dramatically colorful. She loves morning glories and particularly liked the colors in "Bob's Garden" and "Daffodils on Sunday Morning".....both displayed on the right. She liked the idea of a double row of bevels on the outside as in "Mona's Window". In full sun exposure, all those bevels will be send rainbows of color throughout the room. We came up with a drawing (below) that incorporated design ideas from both, and started construction with the new year. Sharon was kind enough to send a picture taken of her window in full sunlight hanging in her kitchen. 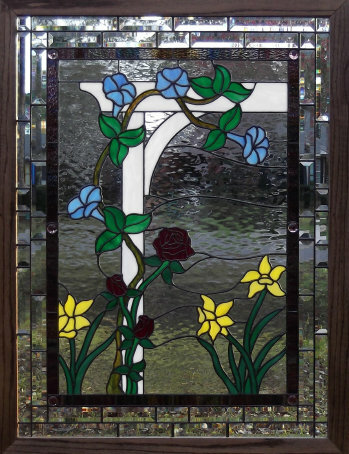 Sharon's Flowers contains 284 pieces of glass. It was completed in Jan, 2012 and measures about 33" x 42" including its 2" red oak frame. It now enjoys the warm Louisiana sun coming in Sharon's kitchen window.